The exploration for this column starts with Robert Maillart beamless mushroom slab structure. The ambition for the patented structural system was to suppress any beam supports between slabs and columns, reminiscent of timber and steel structures. To do so, Maillart proposed to flare the top of columns to decrease the bending moments in the slab, usually resisted by a set of beams. Not only, Maillart’s columns flared upwards to distribute the ceiling loads on larger areas, but some also flared downwards to reduce pressure on the soil foundation. The elimination of beams allowed the slab and columns to perform as a monolith connection. Column 7 takes the doubly-flared primitive (top and bottom) and vertically repeats it to create a compound of 13 tall and slender elements of various periodicities and of changing density in section. The primary aim is to reorganize a multi-storey high-rise into partial aggregations of horizontal instants, unevenly distributed across the height of a column. To free the horizontal datum internally, the central core has been relocated on the periphery, into six smaller cores. This process of sieving the horizontal discloses a high grade of porosity throughout the column’s cross-section, given by the different periodicity of each slender column. The level of porosity distributed within the column, varies upon its orientation. Its density is calibrated based on analysis of yearly solar exposure. The shorter the periodicity of an element is, the more shaded areas are created for indoor-outdoor living, as a consequence. Each vase-like element is habitable, yet a proposed living unit is not just confined within its own boundary. Instead, each unit type is formed from various aggregations of neighboring elements, when meeting at a specific datum. Having less periodic changes and therefore less density on the northern side, results in living units that are more vertically defined. In contrast, the ones facing south, by being subjected to a higher density ratio, are predominantly arranged horizontally. To address an irregular stepped ground, each of the thirteen footings of the concrete prototype can independently receive a range of height differences. The tested formwork method for the prototyping of this column is modular. 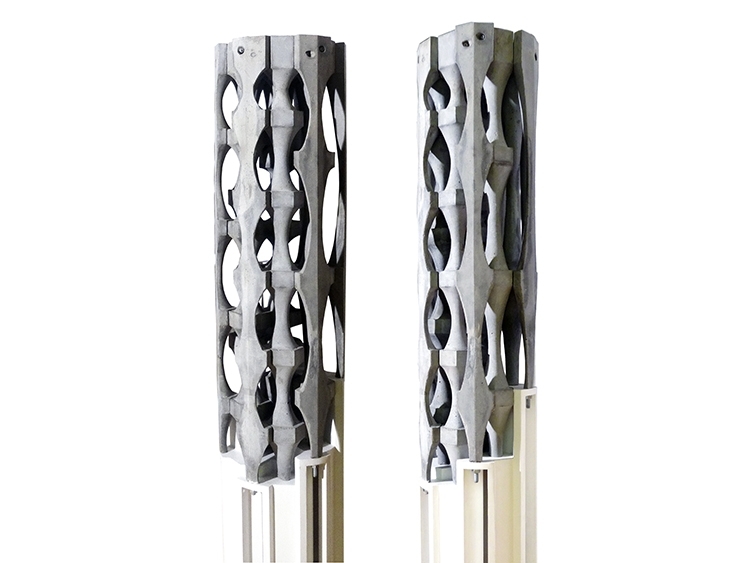 The negative balusters are comprised of rigid parts for the slabs and soft ones for the vase-shaped elements. The vase-like modules are made with fabric stretched on wooden edge profiles. To fabricate the column, 9 two-part formworks are required; 1 of 3 balusters, 2 of 2 and 6 of 1. After casting, the 9 concrete parts are fastened together with rods piercing trough the top slabs of each concrete baluster. In general, the fabric technique, incrementally developed throughout some of this prototyping exercises is not dissimilar to an effective method invented by Philippe De L’Orme, now called stereotomy. This art of stone carving made efficient use of projective geometry by translating spatially complex solids into two-dimensional templates to guide the stone cutter in the carving of a block. The method employed here also rationalizes complex solid geometries into frameworks of simple 2d profiles from which a softer material (geotextile) optimally interpolates the overall three-dimensional negative space for volume casting.